Foreword by James A. Moore. SIGNED by most, if not all of the 8 artists! Clans of werewolves have been with us for thousands of years, but it all began on the banks of the Tiber River in 771 BC. A Lonely shepherd found twin baby boys suckling at the teat of a she wolf. He brought them home and raised them as his own. On the boys 16th birthday they discovered the horrible truth about themselves. What they are. One loves the rush of power and wants to create an army, the other wants to stop him. This is the tale of Romulus and Remus. A story of awareness, revenge, love and violence. Good versus evil. A historical drama that spans the ages and gives us the story of the birth of Rome written in the crimson reds of royal blood on the ghostly sands of time. “WEREWOLF BLOODLINES: is ambitious, sprawling, and hugely entertaining. It's jampacked with epic action, historical detail, and genuine terror, but never loses sight of the human foibles that make for truly great fiction. With this book, Mike D McCarty moves to the frontlines of the most exciting new voices in horror fiction.” — Lisa Morton, Bram Stoker Award-winning author of NETHERWORLD and TRICK OR TREAT: A HISTORY OF HALLOWEEN. 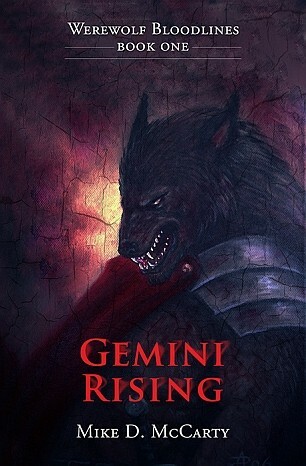 I enjoyed the hell out of this novel … Mike McCarty does for werewolves what Anne Rice did for Vampires… He takes the concepts of what a werewolf story can be and expands it farther than I would have honestly thought possible before reading GEMINI RISING. — James A Moore, SERENITY FALLS TRILOGY and SEVEN FORGES.